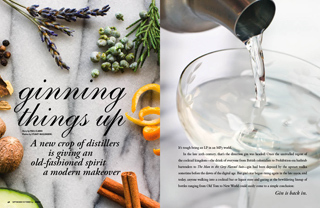 The Cocktail Chronicles is an ongoing exploration of fine spirits, creative cocktails and classic mixology. This web log was created in May 2005 in an effort to document the drinks I’m experimenting with at any particular time, along with thoughts on cocktail ingredients, brands and types of spirits and the overall culture of drinking (I also discovered that it’s a handy way to keep track of all those cocktail recipes I was always losing on little slips of paper or in the little notebooks that clutter up my desk). Since its inception, The Cocktail Chronicles has explored more than 200 different drinks; covered the home-brew of obscure cocktail ingredients such as NBA Betting Oddspimento dram and falernum; been the founding site and ongoing moderation source for the regular virtual cocktail party known as Mixology Monday; attracted—oh, hell, lots of readers (and pissed off a few, too); and presented only slightly inebriated daily updates from Tales of the Cocktail, the nation’s foremost cocktail event. The Cocktail Chronicles is updated somewhat regularly by Paul Clarke, a Seattle-based cocktail enthusiast whose brief experience working behind a bar entailed nothing more challenging than pouring pitchers of Coors Lite for college students with fake IDs. I had my mixological satori in the Summer of 2003, and since then I’ve taken the “roll your own” ethic of David Embury to heart, spending countless hours reading about, mixing and studying an array of cocktails, with a special emphasis on early- and mid-20th century classics. In addition to documenting these endeavors on The Cocktail Chronicles, I’m a contributing editor at Imbibe magazine and I’ve written articles on spirits and cocktails for the San Francisco Chronicle, Wine & Spirits, Entrepreneur, Edible Seattle, Seattle Met and Seattle magazine, and a series of essays on the culture of drink for the New York Times‘ Proof blog. * I’ve also contributed two spirits-and-cocktails-related posts per week to the excellent group food blog Serious Eats since July 2007, and written a chapter on the history and character of the gimlet to the first edition of Mixologist: The Journal of the American Cocktail. 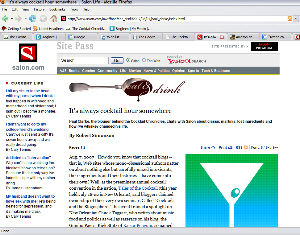 While I’m not convinced it’s a good thing when one’s drinking habits attract media attention, I was profiled by Salon.com in August 2007 and in the Seattle Post-Intelligencer in January 2009 (plus here’s a somewhat cringe-worthy TV profile that ran on KING-TV’s “Evening Magazine” in March 2010); and this very blog was featured as a Yahoo! Pick in 2007 and was covered as an “Online Find” by the Boston Globe in February 2008. 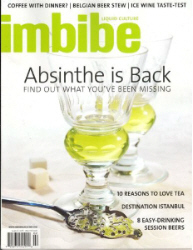 I’ve also been featured making sozzled observations and half-baked pronouncements about spirits and cocktails in publications including the New York Times (twice! ), the Washington Post, the Seattle Times, Seattle Metropolitan, the Pittsburgh Post-Gazette, the Baltimore Sun, SFO (Stocks, Futures & Options Magazine — I know, surprised me, too), Tiki Magazine (that’s more like it) and — rock on — the Tulsa World. I’ve also been invited to chat about drinks with “Weekday” host Steve Scher on local NPR affiliate KUOW not once, but twice. In non-booze related life, I work as a writer in Seattle, and—but you didn’t come here to read about that.